The 2005 Mussels of the Month. 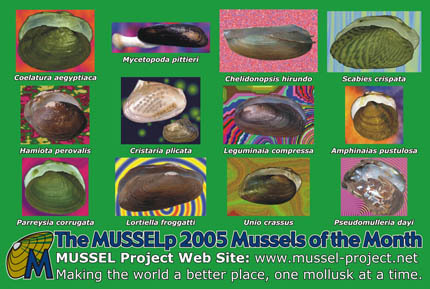 The December 2005 Mussel of the Month is Pseudomulleria dalyi. Ps. dalyi is a Gondwanan species found in India and one of only a handful of cementing freshwater mussels. Pseudomulleria is one of three (or four, depending upon the authority) monotypic genera that comprise the Etheriidae. Etheria is widespread in Africa and Madagascar, Acostaea is found in Colombia and Pseudomulleria has a restricted distribution in India. The disjunct distribution of the members of the Etheriidae suggests that the family pre-dates the Mesozoic break up of Gondwana, the southern super-continent. Recent molecular phylogenetic work by Bogan & Hoeh has suggested that Pseudomulleria may actually belong to the family Unionidae. That conclusion is especially interesting since, as far as is known, Pseudomulleria is morphologically quite similar to Acostaea, which Bogan & Hoeh maintain as an etheriid. The evidence for and against this proposed revisioin was discussed by Graf & Cummings. The November 2005 Mussel of the Month is Unio crassus. U. crassus looks like quite a plain-Jane mussel from Europe, but it has a truly bizarre spurting behavior. We have already had a species of Unio as the Mussel of the Month, Unio pictorum in October of 2003. Given the number of mussel genera that we haven't done yet, it might seem odd to come back to Unio so soon, but the news recently published by Heinrich Vicentini of this mussel's "spurting" behavior has earned it a spot in the limelight. Check out these pictures, courtesy of Dr. Vicentini: picture 1, picture 2. U. crassus crawls up to the edge of the water, exposing its excurrent aperture, and then lets loose a stream of water. The fountain of water often contains glochidia, and Dr. Vicentini suggests that this spurting behavior may facilitate dispersal of mussel larvae. This makes us wonder what other sorts of mussel behaviors are waiting to be discovered  especially among the species that are not as well-known as Unio crassus! The October 2005 Mussel of the Month is Lortiella froggatti. Lortiella is a small genus confined to the northwestern part of Australia. At present, the genus Lortiella contains only three species, although one of those was just recently described. Anatomically, it is similar to the genus Velesunio, but Lortiella is more elongate in outline. Based upon recent phylogenetic work (Graf & Cummings, accepted), Lortiella forms a clade with Velesunio (and some other genera) known as the Velesunioninae. That subfamily is a remnant of the basal lineage of the Hyriidae. Like the platypus, velesunionines are "living fossils" found only in Australasia. The September 2005 Mussel of the Month is Parreysia corrugata. Parreysia is a diverse genus found predominantly in India, but also throughout southeastern Asia. Parryesia is a diverse genus (nearly 40 recognized species), although it will probably be subdivided somewhat once it is revised. Early in the twentieth century, the genus Parreysia was used for sculptured taxa in Africa as well as India and Indochina. Those African forms are now considered to belong in Coelatura (and related genera), and Parreysia, as presently conceived, is regarded as strictly Oriental. However, little is known of its phylogenetic relationships beyond its placement in the Unionidae. P. corrugata is the type species of the genus. The August 2005 Mussel of the Month is Amphinaias pustulosa. Amphinaias is widespread in the Interior and Gulf Coastal basins of eastern North America. Members of the genus Amphinaias have generally been treated as part of Quadrula. However, a recent molecular phylogenetic analysis by Jeanne Serb et al. has demonstrated the monophyly of several traditionally recognized subtaxa within Quadrula; given the conchological distinctiveness along those groups, we have decided to treat them as genera. The July 2005 Mussel of the Month is Leguminaia compressa. Leguminaia is endemic to Mediterranean Europe and the Middle East. Leguminaia is a genus of unknown affinities. Modell and Starobogatov both placed it among the Margaritiferidae. Othe authorities, however, have treated it as unionid. We don't have much to say about it. The June 2005 Mussel of the Month is Cristaria plicata. Cristaria is an Asian genus used in China to culture freshwater pearls. Cristaria plicata is an anodontine mussel  like Pyganodon or Alasmidonta  found throughout eastern Asia, including China, Japan and Indochina. Like its North American counterparts, Cristaria has reduced hinge teeth and a subtriangular, hooked glochidium. Specimens are often very large, sometimes over a foot long! Cristaria, along with other freshwater mussel genera, is often used in the cultured pearl industry. For more information on freshwater cultured pearls, follow the links below. American Museum of Natural History Pearls Exhibit.  Web site designed to accompany the widely traveled museum exhibition developed by the AMNH and the Field Museum of Natural History. Nova Website: Cultured Freshwater Pearls.  by Fred Ward. 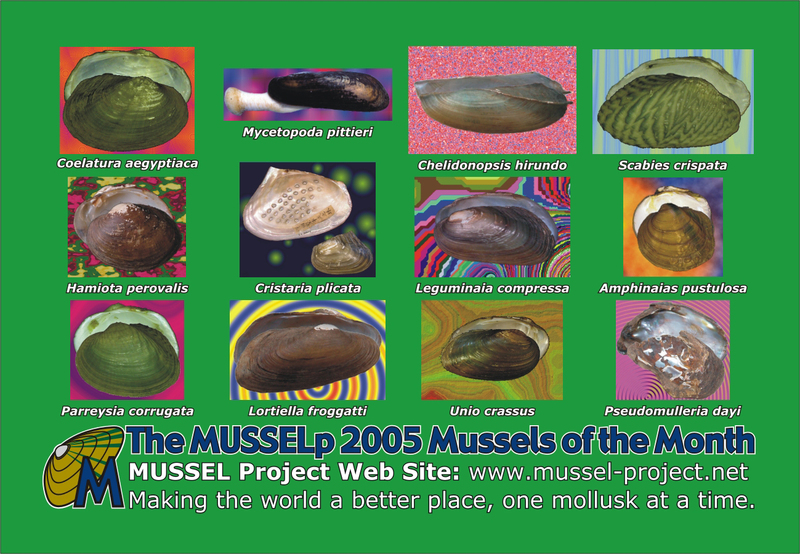 The May 2005 Mussel of the Month is Hamiota perovalis. Members of the North American genus Hamiota go fishing for their host fish using super-conglutinate lures. Freshwater mussels of the bivalve order Unionoida have an interesting life cycle: their larvae are parasitic upon freshwater vertebrates. As the well-known Red Queen Hypothesis would predict, this interaction between host and parasite has produced some interesting evolutionary results. In most freshwater mussels, the larvae reach their host passively, but H. perovalis uses as super-conglutinate lure to "fish" for its host. Amazing! Hamiota is the first genus introduced to classify North American mussels in over 20 years. We are sure that there are even more to come! Keep up the good work, Kevin and Paul! The April 2005 Mussel of the Month is Scabies crispata. Scabies is an unfortunately named genus of five species found from southeastern Asia. We know very little about Scabies crispata except that it belongs to the family Unionidae; its affinities within that family have not been evaluated phylogenetically. S. crispata has unhooked glochidia and broods its larvae in all four demibranchs ("gills"). The March 2005 Mussel of the Month is Chelidonopsis hirundo. The genus Chelidonopsis occurs only in the Congo River basin in central Africa. There is very little known about Chelidonopsis. Specimens have been found at several localities in the Congo basin, from Malebo (= Stanley) Pool up to the Lualaba. Some authors (e.g., Mandahl-Barth) have treated Chelidonopsis as part of the genus Mutela, but C. hirundo is certainly distinct from other species, with the posterior parts of its valves pinched in bizarre tail-fins. We follow Daget (1998) in recognizing Chelidonopsis as distinct as a harbinger of Mutela's impending revision. The February 2005 Mussel of the Month is Mycetopoda pittieri. The genus Mycetopoda is widespread in the New World, from South America north into Mexico. Freshwater mussels in the genus Mycetopoda are unique in that they have a long "mushroom-shaped" foot (hence the name Mycetopoda). They use the foot to anchor themselves deep into the stream bottom (usually a clay or mud bank). When a predator (or collector) happens upon them they quickly retract the foot and retreat into the substrate thus avoiding capture. It isn't always successful as many streams are littered with the broken shells of these animals left over by wading birds that had been feeding on the mussels. 2005 MUSSELp Mussels of the Month Postcard.